What is ‘Tougher than Weather’ all about? This time of year is all about keeping motivated. The truly committed will always beast through the winter to head into the spring ride fit, but others need a bit of help to prevent the bike from being relegated to the garage. I think we can all agree that the British winter can be less than inspiring for the everyday cyclist, but for every problem we have a solution that will help you keep riding in comfort and safely. Raining? GORE-TEX, all season tyres and bikes with disc brakes. Windy? GORE WINDSTOPPER, cold? Primaloft insulation. Being ‘tougher than weather’ is about not making excuses, staying focused and acknowledging that it will take more than just a bit of wind and rain to stop you from getting out on your bike. No matter the weather, it’s about getting the adrenalin of a high speed decent, the accomplishment of topping a hill climb and the sense of achievement when you get back from the ride, endorphins pumping and a big smile on your face. If you keep the core as warm as possible you are more likely stay warmer for longer and therefore enjoy your ride being as comfortable as you can. This winter season, we have ranged the most innovative and cutting edge insulating tech to keep your core at the right temperature. Part of GORE BIKEWEAR’s new and technologically advanced ONE range, the THERMIUM jacket offers optimal insulation on the coldest of days thanks to PrimaLoft® Gold Insulation. Warm and windproof, the THERMIUM jacket is water resistant and breathable and features an adjustable hood for added warmth and versatility. Lightweight, windproof and insulating, the brand new PrimaLoft® gilet from Endrua is a simple and effective way of keeping warm during the winter season. A staple piece for anyone tackling the cold this winter, this gilet features ultra-warm PrimaLoft ® insulation that keeps the body temperature regulated, whilst remaining breathable for strenuous cycling. The FS260 Pro SL also ingrates with the Endura Pro SL Shell for ultimate versatility. Providing lightweight warmth for those rides where you’re pushing it to the limit, the Women’s Ksyrium Insulated Elite jacket is the ultimate garment that can to be worn as an outside layer or as a mid-layer for added warmth. Featuring PrimaLoft® Sport insulation, the garment delivers superior warmth in a minimal weight without jeopardising breathability and manoeuvrability on the bike. Undeniably stylish and fashion conscious, Pearl Izumi have always created striking garments, without compromising on fit, form and function. The Elite Thermal Escape Thermal Hoody upholds Pearl Izumi’s remit of sleek cycling garments with a lightweight ELITE Thermal fleece construction for ultimate warmth whilst remaining super breathable. 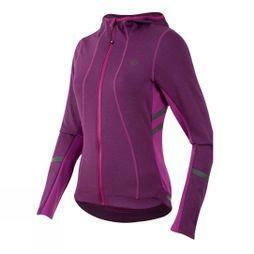 Innovative features include ‘ponytail compatibility’, a Semi-Form fit and reflective detailing.